Although one could be forgiven in thinking that this game is a clone of Marble Madness, however in actual fact, Madballs is a third-person shooter that does rely on physics (rolling) and a healthy dose of weaponry. Boasting both single-player and multiplayer options, Madballs in Babo: Invasion is an interesting twist on the classic third-person shooter. The catch behind the title is the ball physics which is a little frustrating at the beginning, however as you play, you will soon master this little deadly ball of weapons. The control system is at times reminiscent of a pinball machine as you use the analog sticks to move and shoot your enemies. As you progress, you will be able to unlock a healthy dose of new weapons, each with their pros and cons and needless to say, there is a great variety which is needed against the enemies that you face. 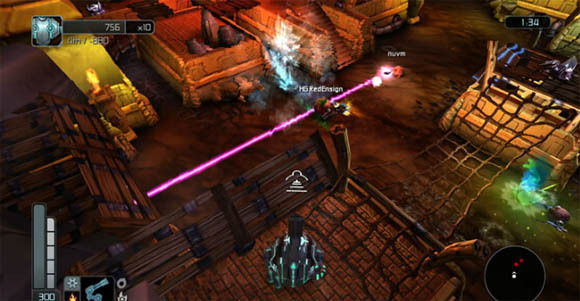 The environment will also pose a challenge to the player, especially from the spikes and pits that you encounter and when the enemies are out and about, controlling your little avatar can sometimes become quite frustrating. 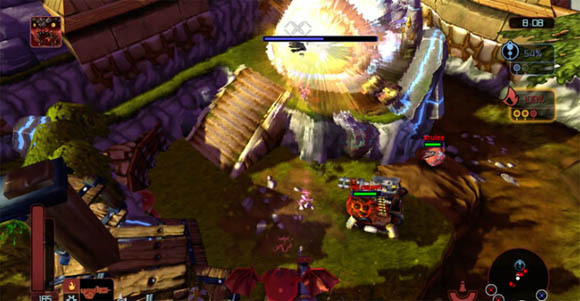 The game contains two different views that include an isometric view and a view from above, with both viewers working equally well. The unfortunate aspect of Madballs is that the gameplay begins to become repetitive as you progress through the game. Initially the fun factor of the game has a “wow” factor, however as you progress, the “wow” factor begins to wane. This is not to say that it’s a bad game, it just feels like something is missing as you progress. Although I did stick with the game, my frustrations started to rise with the difficulty level. The battles in the game are quite fun, however if you rush through the level, you will generally find yourself overwhelmed by the enemies which is a bad predicament to be in. When it comes to multiplayer mode, the title does take a different twist as you engage in classic death match and capture the flag modes. Capture the flag is brilliant and is truly a free for all, however the star of multiplayer is team deathmatch which can be quite fast paced. Lastly, there is “Invasion” which allows you to create to an extend your own maps. Graphically, the title is rather impressive game with some great physics and environment. The special effects are decent as are the enemies that you encounter. The music and sound effects also suits the title, although the voice bites do become a tad repetitive. In conclusion, Madballs in Babo is an interesting game that throws a new spin on classic third person shooters and this game would not look out of place on a Nintendo Wii, however thankfully it’s on the XBox. An interesting game that unfortunately becomes a tad too repetitive, however it’s definitely worth the entry price.